Anthem for the heroic exploits and prominence of emperor. Lei Liang has a predilection for abundant and indistinct mountains and large rivers. The mountains and waters painted in recent years is the principal subject in his pure colour world, or more expressly, a designation of Lei Liang's individual art. The mountains and waters do not interosculate any concrete natural landscape. He shows only the mountain arteries and flowing waters tendency. Lei Liang's painting contains strong emotional billows, a tangled combination of despair and optimism, gloom and vehemence, sorrow and joy, and at the same time, there exists a permanent placid as a sangfroid feeling after big sorrow and big happiness experiences...... The equability and equilibration of the conflict and impact is a process of passion release and remission, and no person can arrive to accomplish this special art assembly without idiosyncratic personality and powerful control. On one hand he brought to his painting western strong and rich oil paints, on another he adopted the vigor style of Chinese mountain-water art system. Only the compulsory integration of agility, placid, colourfulness and dignity can release and assemble the interior passion, that can only be achieved in a profound contrast. Perhaps no one more than Lei Liang can holds and feels this pure colour world as he is so totally devoted and sensitive to ego interior sight. In contemporary painting circles in China, we can rarely find at present any painter such as Lei Liang, so devoted to his own interior sight without any antiquated conventions. Luo Shiping: "An Undulate World in Pure Colours -- Lei Liang's Oil Painting on Rice Paper"
Like a cold and hot spring flowing out from his deep interior heart, his painting can be traced all along to the hoariest human times. It is difficult for me to imagine that in this information-explosive epoch a man can still have a lonely as well as desolate interior prospect, and work with perseverance to describe such an ultimate simplicity one time after another. This motivation in my eyes is neither commercial nor so-called cultural, but probably a merely expressive impulse. Indeed, this is extremely valuable for a modern man with such a pure impulse and recluse quality. 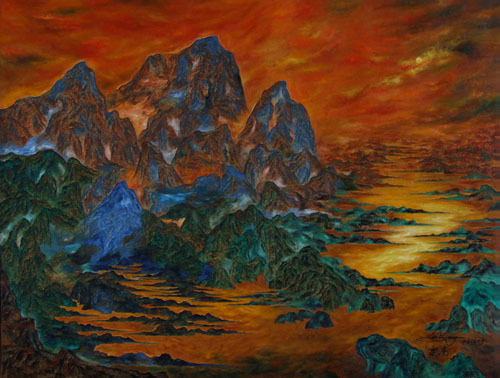 Liu Yan: "Pure Heart in Magnificent Mountains and Waters -- Lei Liang and His Painting"
This is an ancient and desolate world, full of mysteries: Lengthy and broad land, distant mountains, no any human being there. Superposed and overlapped multipeaked mountains and rushing rivers, all of them are in a silent position. The sun loses here its temperature. Although very red, it is cool, and its existence is only for the purpose of ornament. Here its temperature is not needed, even the brightness has nothing to do with it. Herein, this is such an awe-inspiring, quiet and serene world, that looks like arranged specially for those souls that require to be consoled. If to surpass name and title is an obvious feature in Mr. Lei Liang's painting, to surpass visual experience will then be another obvious feature in his painting expression method. Since Mr. Lei's painting is naturally achieved in Zen realm, it will inevitably surpass name and title, as well as ordinary visual experience, and inevitably possess multi-informational connotation. 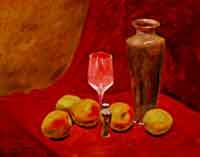 Different people, in front of his painting, fetch respectively what they need and obtain different feelings. Li Yuan: "Painting from Another World - Comment on Mr. Lei Liang's Oil Painting on Rice Paper"